LAKE LURE, NC (August 24, 2015): Autumn’s prism of golden hues will be arriving shortly in Western North Carolina’s Lake Lure and the Blue Ridge Foothills and leaf-lookers are invited to choose their own way of admiring all this mountain color. With no stoplights for more than 12 miles in any main direction, and no stop signs along the major lakeside highway, visitors can cruise through Lake Lure’s Hickory Nut Gorge and enjoy the breathtaking views of Mother Nature’s hand-painted canvas. For ultimate leaf gazing, head to Buffalo Shoals Road in Lake Lure or make your way along the historic Cherry Bounce Trail Driving Tour in eastern Rutherford County for a scenic perspective of our foothills. 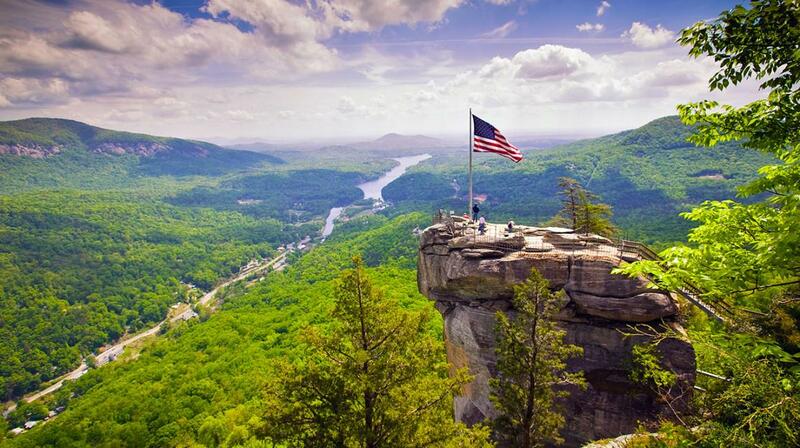 If you prefer to get up close and personal to examine Mother Nature’s artwork, hike to the top of the 315 ft. tall Chimney Rock at Chimney Rock State Park for a grand 75-mile panoramic view of glorious color blanketing the Blue Ridge Mountains. Or, walk the beautiful Lake Lure Flowering Bridge featuring more than 700 species of plants and flowers. With thousands of visitors every year, it is only the second bridge of its kind in the nation and full of gorgeous fall color! Add even more adventure to your tour by zip lining right through the fall foliage itself at Canopy Ridge Farm or Boulderline Adventure Programs, both located in Lake Lure. Enjoy autumn’s scenic display reflected in the mirror-like surface of Lake Lure up close and personal! We suggest a comfortable cruise via pontoon boat around the 27 miles of pristine shoreline. No boat? No problem – rent one for an hour or longer from Lake Lure Adventure Company or book a boat tour with Lake Lure Tours. Make it a weekend and book a mountaintop getaway with one of our vacation rental companies. Rumbling Bald Resort at Lake Lure offers lake houses and condos with views of both the lake and mountains, or tuck yourself away in a mountainside rental surrounded by fall foliage like the retreats at Arbor Cabins & Cottages. Add ambient sound to your night and sleep riverside at The Carter Lodge in Chimney Rock. Find the perfect place to rest your head at www.RutherfordTourism.com. The true fall color season in Lake Lure and the Blue Ridge Foothills runs late October through mid-November. Stay for an hour, a day, a week or the entire season and cast your cares into the brisk mountain wind. Plan your trip now at www.RutherfordTourism.com, call 828-287-6113, or visit us on Facebook. Retreat to a destination where simple pleasures outshine digital-age spectacles – a place where Main Streets reign over mega malls; where nature delivers the best adventures; and where history lives boldly and visibly in architecture, story, song and spirit. Experience these journeys and more when you visit Rutherford County located in the majestic Blue Ridge Foothills of Western North Carolina. Home to Lake Lure, Chimney Rock, Rutherfordton, Spindale, Forest City and Bostic, there is a world waiting for you to explore, enjoy and love. More info, visit www.RutherfordTourism.com or call 800-849-5998.